All raw materials were indigenously produced based on our technology. India’s space scientists have always made us proud. The country is a superpower in terms of achievements in space. Here is one of those heroes, Dr V.N. Krishnamurthy, former deputy director of Vikram Sarabhai Space Centre (VSSC). He proudly recalls being part of the development of India’s first rocket — Mrinal —which was launched 50 years ago by the Propellant Engineering Division of the Space Science and Technology Centre in Thumba. “Dr Sarabhai’s dream of space exploration took a giant leap at Thumba, on February 21, 1969, with the successful development of a composite solid propellant that powered the RH 75 rocket around 8.05 am, marking the Indian space programme’s beginning. A small step in propellant technology, a big leap for Indian space programme,” says Dr Krishnamurthy. Although we may not view it as a remarkable achievement today, the use of a rocket with a new class of propellant, rather than double base propellants such as ‘cordite’, was a major step towards attaining higher energy and bigger sized propellant grains required by rockets to explore space. 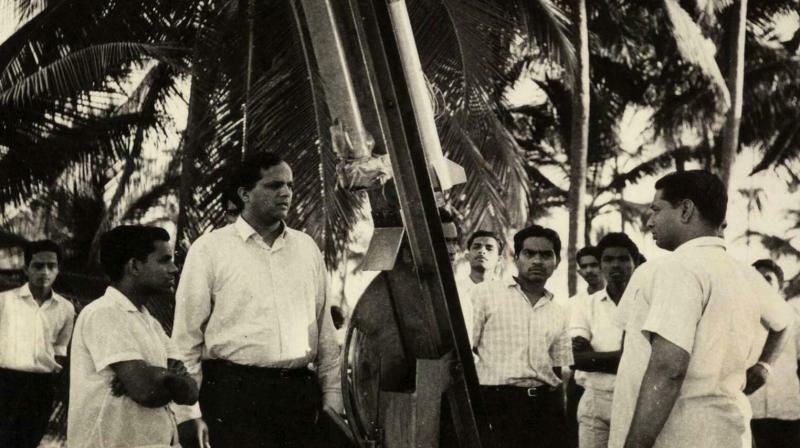 He says, “Mrinal was a small, one-metre-long rocket with 75mm diameter, and carried 4.5 kg of propellant. The whole rocket weighed 10kg and it reached an altitude of 4.6km. Today, our GSLV carries two boosters of 210 tonnes each as strapons to a liquid core booster weighing 640 tonnes, and can put three tonnes of satellite in the geostationary orbit.” The former used a polyester-based propellant while the latter used a hydroxyl terminated polybutadiene propellant. All raw materials were indigenously produced based on our technology. Thus began an extraordinary period of space exploration in what was to become a significant decade, dubbed “swinging sixties”, a description in part due to the excitement of the rapidly developing propellant development race. “Six months later, on July 20, 1969, the US landed man on the moon. Neil Armstrong’s first moon walk and his famous words, ‘A small step for man and a big leap for mankind’, will remain one of the most exciting events of the 20th century. The propellant was named Mrinal after Dr Sarabhai’s wife Ms. Mrinalini,” says Dr Krishnamurthy, who retired from service 22 years ago. “Prior to this, the RH 75 project was successfully flight tested using the cordite (double-base propellant) from Ordinance factory at Aravankadu, in Tamil Nadu, on 20 November 1968,” he adds. This double-base propellant was used by our Defence in their rockets at that time considering the non-smoky nature of the exhaust gases. The double-base propellants are not suitable in launch vehicles due to their low energy content and propellant blocks of large diametres. At that time, Indian Ordinance factories were producing the propellant grains or blocks by extrusion technique which restricts the size of the grains to a maximum of 125mm. “Hence, a new kind of propellant has to be developed for the ambitious space programme envisaged by Dr Sarabhai, the Father of Indian Space Programme. Thus, a small beginning was made by Dr Vasant Gowariker, the then Head PED, and his team, which culminated in the successful development and launch of composite propellants,” says Dr Krishnamurthy. Hydroxyl Terminated Polybutadiene (HTPB) which boosts our current PSLV and GSLV rockets is the latest addition to the family of composite propellants developed following the successful flight testing of polyester-based propellant in a DTV. The composite propellant based on High Energy Fuel (HEF) was used as an apogee motor in APPLE programme. The same propellant was also used in our SLV 3 and ASLV third and fourth stages. In addition, we are self sufficient with the raw materials required for the manufacturing of these composite propellants. The oxidiser required is made and supplied by Ammonium Perchlorate Experimental Plant (APEP) at Aluva, Kerala, and HTPB, the polymeric binder required is made at our own plant (PFC) at Thumba, and in private industries with our technology. Thus, the major ingredients needed are made with our indigenous technology and in our own plants today.